The Ebac DD300 is the second most powerful in the DD range of Ebac desiccant dehumidifiers. This type of dehumidifier is effective at very low temperatures and/or where extremely low levels of humidity are required. This unit is designed for commercial and industrial applications where the capabilities of a refrgrigerant dehumidifier are inadequate to meet the special demands of some production, storage, processing, scientific, medical and other environments. A desiccant dehumidifier is, for example, the only type of dehumidifier able to offer significant dehumidification in temperatures below freezing point. The Ebac DD300 dehumidifier does not condense moisture from the air by passing that air over a cold surface in the manner of a refrigerant dehumidifier. A desiccant dehumidifier captures water molecules by using a desiccant material, silica gel, by means of a chemical process. A desiccant, or hygroscopic material, will absorb water from air until it is saturated. By applying heat to the desiccant the water is returned to vapour and the desiccant is thereby "regenerated" and will continue to absorb more moisture. There are two means by which the moisture may then be removed from the dying area. Some desiccant dehumidifiers condense the moisture released from the silica gel and the condensate is then collected or drained, in a similar way to a refrigerant dehumidifier. This has two disadvantages. The dehumidifier must incorporate a compressor and will, therefore, be heavier and larger than it would be otherwise. The condensate must also be disposed of which, in some situations, is undesirable for the user. 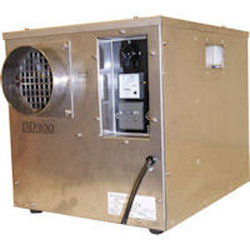 Desiccant dehumidifiers like the DD300 vent the moist air to an area outside the drying area via ducting. This method allows the unit to be smaller and lighter, avoids the disposal of condensate but entails the consequent disadvantage of a ducted installation. The requirements of each operator will vary and the appropriate dehumidifier type will be selected accordingly. In both types the moisture is removed by a slowly turning rotor which consists largely of silica gel, in this case 82% of the rotor is made up from the desiccant. During part of the rotation cycle the rotor is heated to remove the moisture and then re-enters the incoming air stream to resume moisture absorption. The Ebac DD300 incorporates a patented high efficiency rotor which is washable and designed for a long working life. The Ebac DD300 dehumidifier has two major advantages over a refrigerant dehumidifier. The unit will operate in extremely low temperatures. Because the DD300 does not use refrigeration to remove moisture from air there is no ice formation inside the unit. Ice formation interrupts, and eventually stops, effective dehumidification. Because no ice is formed the DD300 can continue to operate at temperatures far below the freezing point of water, as low as -4°F. Where humidity control is required in very low and/or sub-freezing temperatures a refrigerant dehumidifier cannot even come close to this performance. The unit will also operate in high temperatures, up to 104°F. This is comparable to the performance of a typical commercial grade refrigerant dehumidifier but the advantage of the DD300 is its ability to reduce humidity levels far below those achievable by a refrigerant unit, even a Low Grain Refrigerant model. This ability to achieve and maintain very low humidity is the main reason why, where extreme dryness is essential, a desiccant dehumidifier is preferred to a refrigerant model, even where low temperature operation is not required. These advantages will tend to outweigh the drawbacks of a desiccant unit, which are its higher unit cost and higher energy requirement, particularly where high value items requiring a low humidity environment are being stored, produced or operated. Typical applications for this type of dehumidifier include the defence and food industries, pharmaceutical, medical and laboratory facilities, storage areas for moisture sensitive items and locations where delicate electronic equipment is operated. An added benefit in all such applications is the inherently greater reliability of a desiccant dehumidifier. The Ebac DD300 dehumidifier will extract varying amounts of water according to the prevailing conditions of temperature and relative humidity. At saturation and 100°F as much as 80 pints per day is possible. At the AHAM standard, of 80°F and 60%RH, the rate falls to 65pints. At lower levels it falls much further and, at 0°F and 10%RH, only 1.5 pints per day will be removed. As those who operate facilities where these conditions are typical will know, this is an impressive figure. The Ebac DD300 is a durable unit ruggedly constructed from stainless steel for service in demanding environments. The dimensions of the DD300 are only 14 x 16 x 14.5 inches making it a compact dehumidifier which is easy to install in areas where space is limited. The Ebac DD300 is portable weighing only 44 pounds and can be easily carried by one person. Its short-term use in each a series of locations will make it necessary to connect it to existing ducting or to install temporary ducting to expel the moist air to the exterior of the building. A permanent installation of the DD300 is likely to be preferred in most cases. The DD300 incorporates a PTC Heater, ensuring maximum drying is immediately reached and constantly maintained while the unit is running, to improve energy efficiency. It also includes an ammeter to monitor the units drying effectiveness and a remote humidity sensor facility.